Back in June, my sister and I realized that we both had some free time during this week/weekend, so we thought it would be fun to run the Rock n Roll half marathon in Chicago. As far as I know, RnR Chicago is the only summer time RnR race in the United States. Since I don't work over the summer, that's the one I always had my eye on. This would also help me continue my goal of running in new "large" cities. 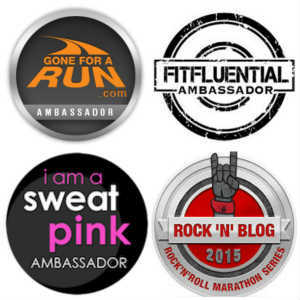 We found out that many other running bloggers would be there, so we were excited to join in the fun! As our planning progressed, we were getting a tad stressed. Our flights didn't seem to line up the way we had hoped and the temps were getting WAY too hot to get myself into half marathon shape. The 10K started to look like it was more my speed (but I didn't find the finisher medal very appealing (not that that was a deal breaker). In the end, it didn't sound like it was going to be a very "relaxing" vacation for us so we decided to stay on the East Coast and vacation in Florida. It actually ended up that we did run a race while we were there. This was so much fun and I can't wait to talk more about it. We are still enjoying our vacation so hopefully we will have more to add to our weekly wrap next week. Thank you to Holly and Wendy for letting us share our week with them! I'm glad I'm not the ^only^ one who couldn't get to Chicago. Maybe next time the stars will align and we can meet up too! Enjoy your vacay. Summer races are tough! After yesterday, I know I need to be careful running in the heat. The heat and humidity for today's race was tough. Sorry that you were unable to come to Chicago bUT it sounds like it was totally the right decision. Glad you had fun in Florida! Yes, we totally think it was the right choice. But we did miss meeting up with all of you. Thanks Megan. We are having fun but we didn't get to relax as much as we'd hoped. Our Florida weather was hot and humid but the rain from Chicago has now made it's way here! You may have made the right decision. I was having FOMO about meeting all the bloggers but the weather was awesome so I feel a little better. We would love to plan something else with you gals! Florida was great! It rained a bit but we didn't have to run in it. Bummer that it didn't work out - but sounds like the stress wouldn't have been worth it. Glad you found another fun race instead! 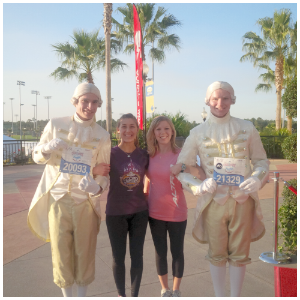 Yes, we did a fun run at Disney! As I heard about more and more bloggers heading to Chicago I briefly got FOMO but I know that I can't jump into a race weekend just because of that. Given that little man and I fly to Illinois on Wednesday, it would have been incredibly silly of me to fly out for the weekend just prior to our big trip. We have too much on our calendar today and tomorrow that I couldn't easily just extend our trip by a couple of days. Enjoy your time in Illinois! I wanted to go too, but just could not justify another trip this summer. Glad you guys found something else fun to do. Yes, I really enjoyed my time in Florida so I'm not really regretting it! You would like this race Chaitali, it was at Disney! I'm sorry Chicago didn't work out for you. Honestly, I thought about cancelling because of the heat. But, it would have cost more to re-book my flight than the ticket cost (ugh). It's funny you didn't like the 10k medal. I liked it so much more than the half marathon medal. LOL. Enjoy your vacation. I'm so glad you were able to run a race while there! Thanks for linking. I bet that 10K medal looked better in person, they always do! It wasn't rainy in Florida but it sure was HOT!